ARCATA – The Arcata Chamber of Commerce presents the 2013 4th of July Jubilee on the Plaza Thursday, July 4 from 10 a.m. to 6 p.m. The event is free and the public is invited. The Jubilee features live music, food, crafts, and more. 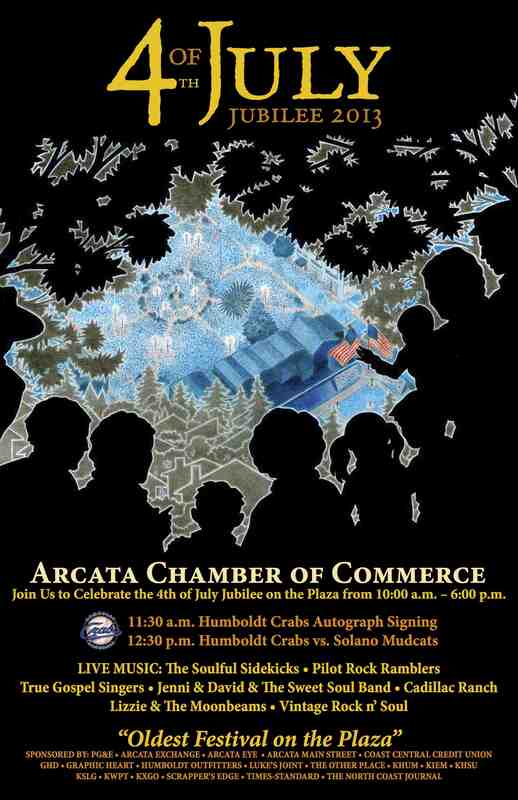 The Humboldt Crabs will be on hand to sign autographs at 11:30 a.m. At 12:30 p.m., the Crabs face off against the Solano Mudcats at the Arcata Ball Park. Music at the 4th of July Jubilee will be provided by Pilot Rock Ramblers (11 to 11:45 a.m.), True Gospel Singers (noon to 12:45 p.m.), Jenni & David & the Sweet Soul Band (1 to 2 p.m.), Cadillac Ranch (2:15 to 3:15 p.m.), Lizzie & The Moonbeams (3:30 to 4:30 p.m.) and Vintage Rock ‘N Soul (4:45 to 5:45 p.m.). Freelove Circus will perform aerial acrobatics on the lawn. The Chamber will sponsor a Strawberry Shortcake booth in conjunction with Brett Shuler Fine Catering. A variety of cuisine and beverages, including beer, will be available for purchase. The 4th of July Jubilee is sponsored by PG&E, Arcata Exchange, Arcata Main Street, the Arcata Eye, Coast Central Credit Union, GHD, Humboldt Outfitters, Luke’s Joint, The Other Place, KHUM, KIEM, KHSU, KSEG, KWPT, KXGO, Scrapper’s Edge, the Times Standard and the North Coast Journal. For more info, contact (707) 822-3619, arcata@arcatachamber.com, or find the Arcata Chamber of Commerce Facebook page. This entry was posted on Wednesday, July 3rd, 2013 at 12:58 pm	and is filed under News. You can follow any responses to this entry through the RSS 2.0 feed.